Showing items in category Zanzibar, sorted by newest listed first. 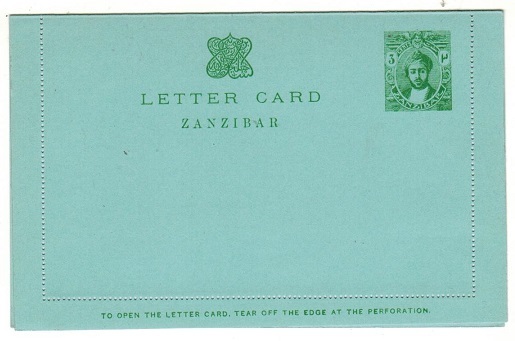 ZANZIBAR - 1913 3c green postal stationery letter card unused. H&G 1. 1913 3c green on blue postal stationery letter card in fine unused condition. H&G 1. 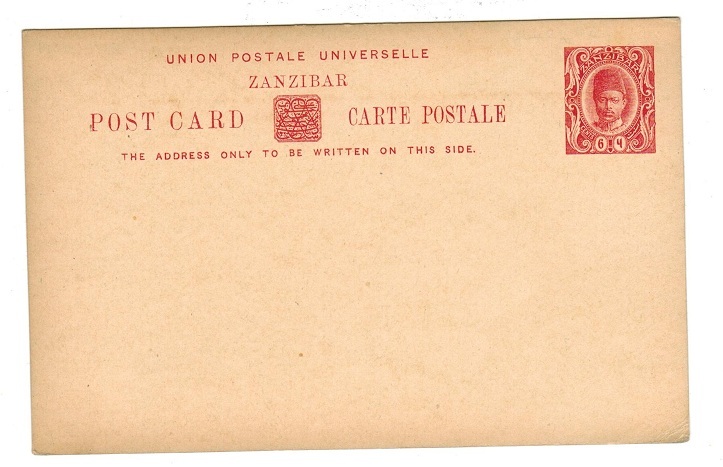 ZANZIBAR - 1913 6c red postal stationery letter card unused. H&G 2. 1913 6c red on blue postal stationery letter card in fine unused condition. H&G 2. ZANZIBAR - 1918 5c deep violet postal stationery letter card unused. H&G 3. 1918 15c deep violet blue on blue postal stationery letter card in fine unused condition. H&G 3. 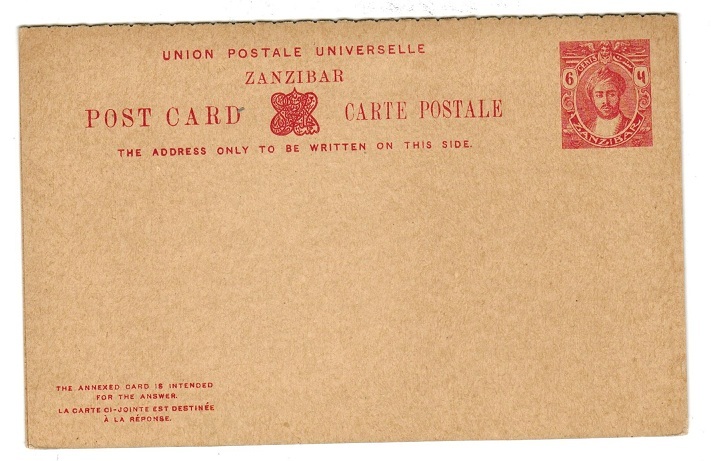 ZANZIBAR - 1926 3c brown orange postal stationery letter card unused. H&G 4. 1926 3c brown orange on blue postal stationery letter card in fine unused condition. H&G 4. 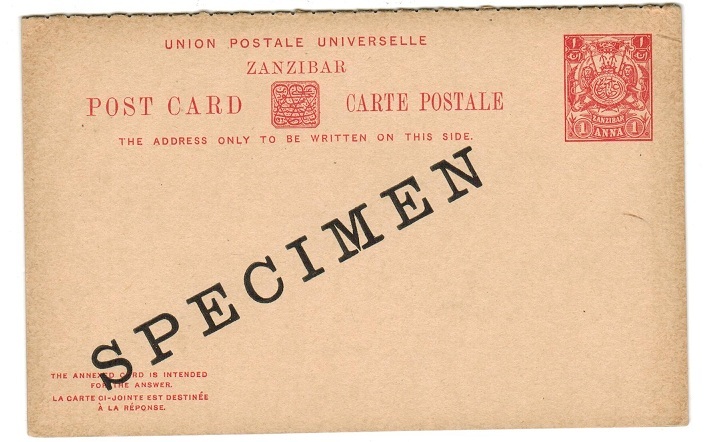 ZANZIBAR - 1926 3c brown orange postal stationery letter card unused with SPECIMEN h/s. H&G 4. 1926 3c brown orange on blue postal stationery letter card in fine unused condition overprinted SPECIMEN diagonally in black. H&G 4. ZANZIBAR - 1926 6c grey violet postal stationery letter card unused. H&G 5. 1926 6c grey violet on blue postal stationery letter card in fine unused condition. H&G 5. 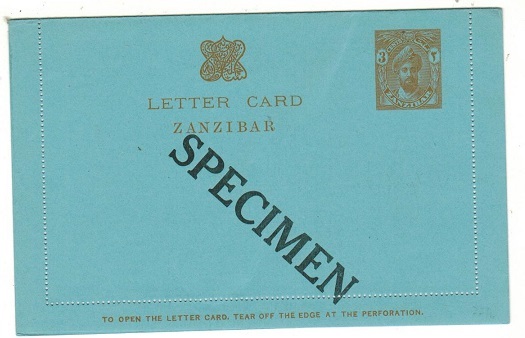 ZANZIBAR - 1926 6c grey violet postal stationery letter card unused with SPECIMEN h/s. H&G 5. 1926 6c grey violet on blue postal stationery letter card in fine unused condition overprinted SPECIMEN diagonally in black. H&G 5. ZANZIBAR - 1942 30c rate 'OPENED BY CENSOR' cover to USA. 1942 (JA.21.) 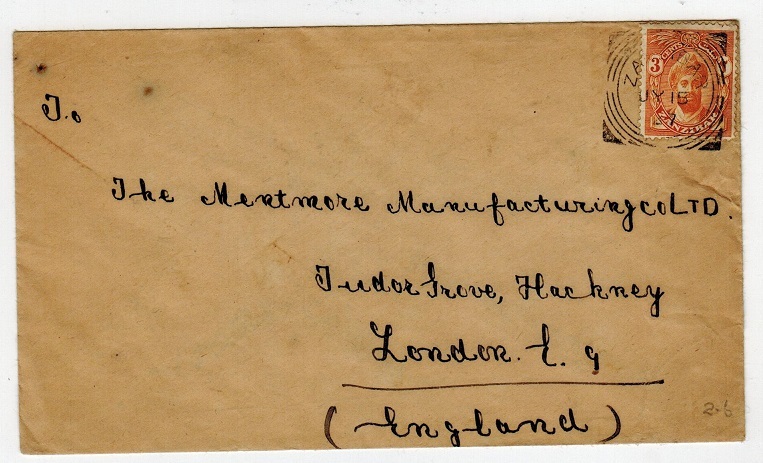 commercial cover to USA (roughly opened at top edge) bearing 10c and 20c adhesives tied ZANZIBAR with red on cream OPENED BY CENSOR label at left. ZANZIBAR - 1957 10c local cover used at KONDE. 1957 (DE.23.) cover addressed locally bearing 10c adhesive tied by lovely crisp KONDE cds. ZANZIBAR - 1901 3a rate cover to Germany. 1901 (JA.13.) 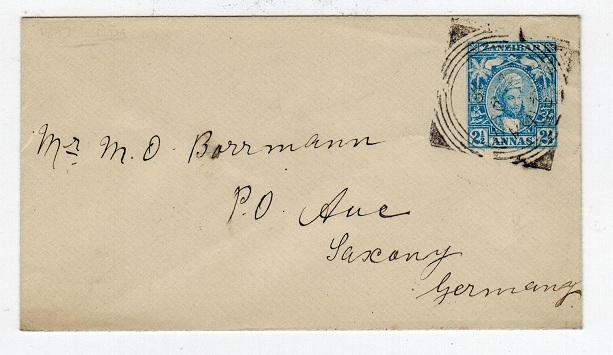 cover addressed to Germany bearing 1a and 3a adhesives tied by squared circle ZANZIBAR cancel. APODA arrival b/s. ZANZIBAR - 1907 use of registered picture postcard to Germany. 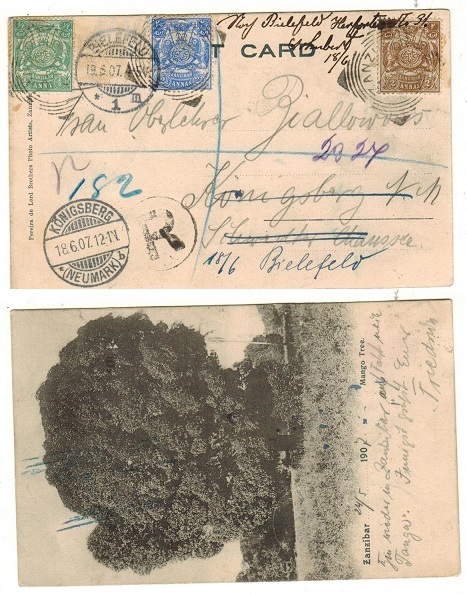 1907 registered use of picture postcard addressed to Germany depicting 'Mango Tree-Zanzibar' bearing 1/2a, 2a and 2 1/2a adhesives (SG 210,212 and 213) tied by squared circle ZANZIBAR cancels. A scarce registered use. ZANZIBAR - 1908 6a carmine PSE uprated to Germany. H&G 10. 1908 6a carmine on laid cream postal stationery envelope addressed to Germany bearing additional 1c,3c and 6c adhesives tied by squared circle ZANZIBAR cancels. A scarce piece of stationery. H&G 10. ZANZIBAR - 1932 multi franked cover to Sudan struck 'TOO LATE'. 1932 (JU.16.) 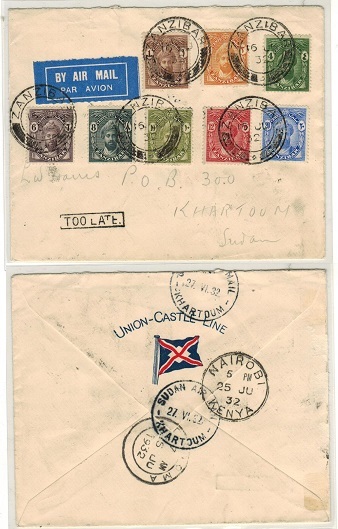 cover addressed to Sudan bearing 1c-20c adhesives tied ZANZIBAR and struck at bottom left by TOO LATE boxed handstamp. ZANZIBAR - 1942 20c rate 'OPENED BY EXAMINER/U' censor cover to UK. 1942 (AU.29.) 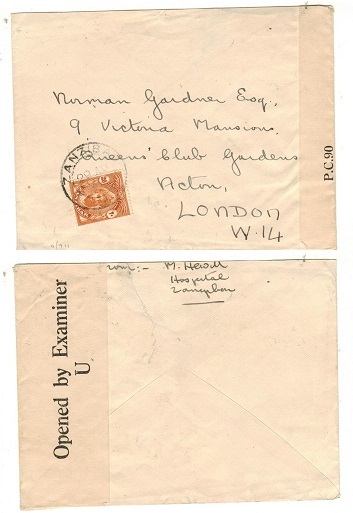 cover addressed to UK bearing 20c adhesive tied ZANZIBAR with black on cream P.C.90/OPENED BY EXAINER/U censor label at right. Little type II. ZANZIBAR - 1943 30c rate 'OPENED BY EXAMINER/U' censor cover to USA. 1943 (JY.31.) 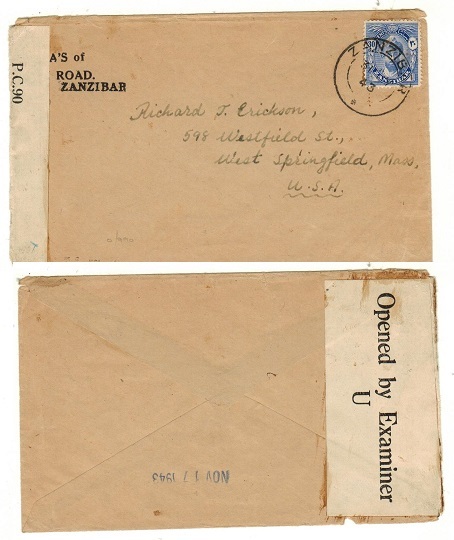 cover addressed to USA bearing 30c adhesive tied ZANZIBAR with black on cream P.C.90/OPENED BY EXAMINER/U censor label at left. Little type II. ZANZIBAR - 1913 12c dark violet RPSE (size J) addressed to Germany uprated at ZANZIBAR. H&G 6a. 1913 12c dark violet on cream registered postal stationery envelope (size J) addressed to Germany (central fold) bearing additional 5c,6c,10c and 25c adhesives tied by s/r ZANZIBAR cds's dated SP.11.13. Odd tone spot. A scarce item used. H&G 6a. ZANZIBAR - 1895 2a6p orange PSE to Daressalaam. H&G 4. 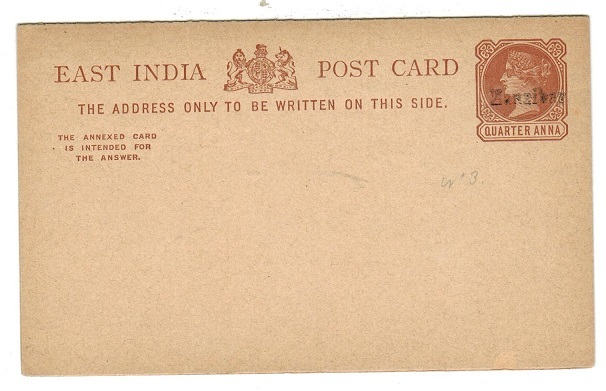 1895 2a6p orange on cream postal stationery envelope of India overprinted ZANZIBAR in black (type e) addressed to Daressalaam and cancelled by squared circle ZANZIBAR cancel dated 30.JY.01. H&G 4. ZANZIBAR - 1892 1a on 1/2a blue 'India' overprinted PSC to Germany used at ZANZIBAR. H&G 9. 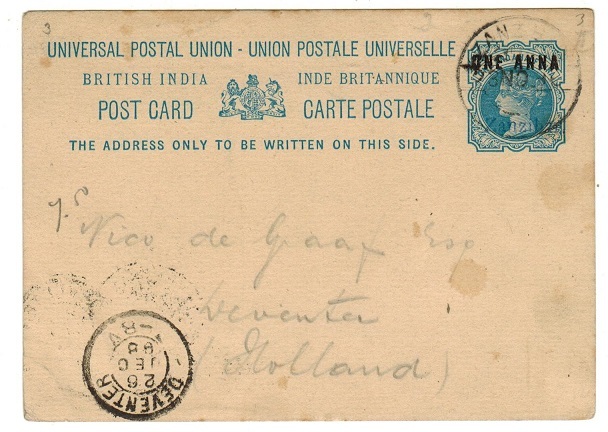 1892 1a black on 1/2a blue on cream Indian postal stationery surcharged postcard (light vertical crease) addressed to Germany (genuine use) and cancelled by squared circle ZANZIBAR cancel dated SE.12.92. Red LIGNE/PAQ.FR.No. maritime strike and ADEN transit cds. Marked 'By S.S.Malda'. 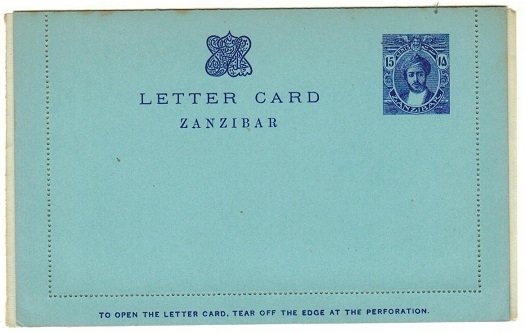 A scarce use of this stationery card in Zanzibar. H&G 9. ZANZIBAR - 1964 'Jamhuri' overprints cover to UK used at ZANZIBAR. 1964 (FE.22.) 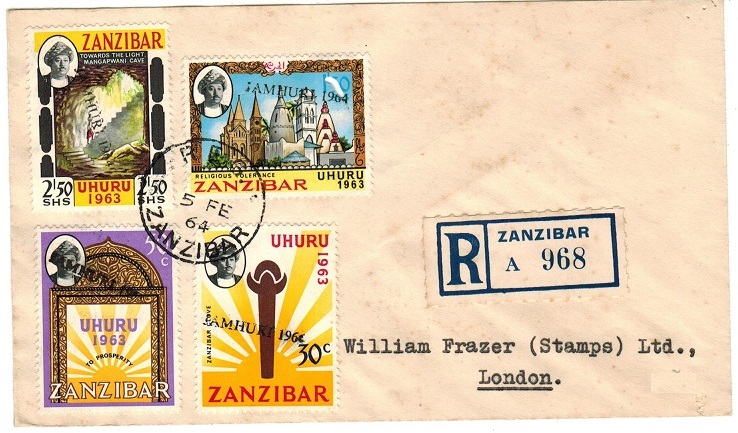 cover addressed to UK bearing 30c,35c,40c and 50c adhesives with the Republic 'JAMHURI 1964' handstamps applied and cancelled ZANZIBAR. 1964 (FE.27.) 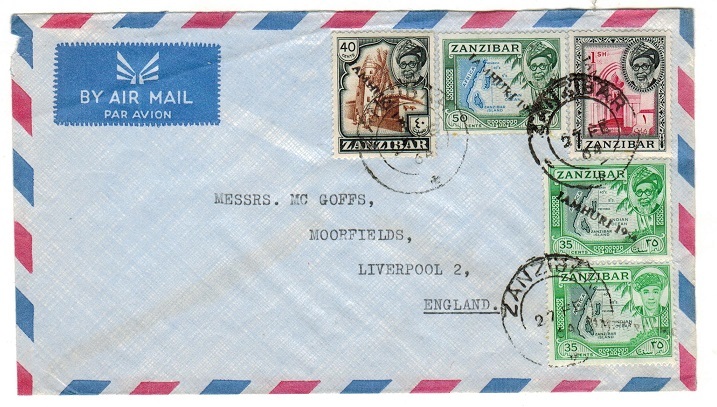 cover addressed to UK bearing 35c (x2), 40c,50c and 1s adhesives with the Republic 'JAMHURI 1964' handstamps applied and cancelled ZANZIBAR. 1964 (FE.27.) cover addressed to UK bearing 5c,35c,40c,50c, 1s aadhesives with the Republic 'JAMHURI 1964' handstamps applied together with the unlisted handstamp on the 30c 'Independence' issue (SG 390) cancelled by ZANZIBAR cds. 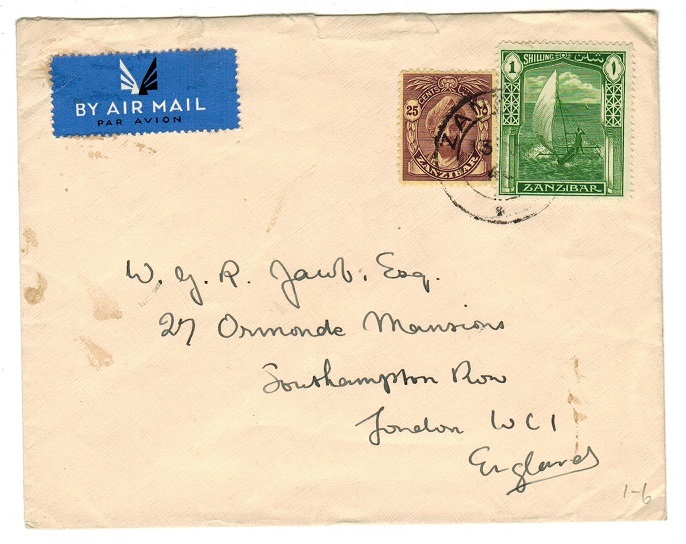 ZANZIBAR - 1932 cover to Southern Rhodesia with 6c adhesive tied PORT AMELIA in Mozambique. Unusual. 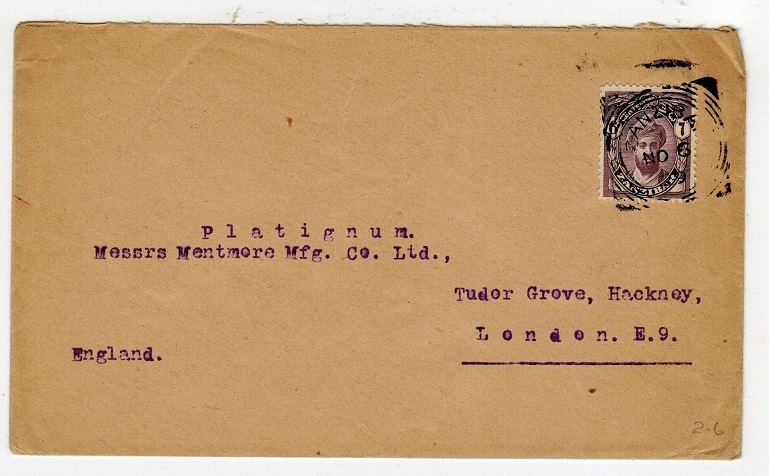 1932 cover addressed to Southern Rhodesia bearing 6c violet adhesive tied by PORT AMELIA sexagonal cancel of Mozambique with BEIRA transit cds. Additional DARESSALAAM and BAGAMOYO strikes applied in Tanganyika with BULAWAYO arrival cds on the front dated MAR.12.32. Unusual use of this Zanzibar adhesive. ZANZIBAR - 1908 3c green on buff postal stationery newspaper wrapper fine unused. H&G 9. 1908 3c green on buff postal stationery newspaper wrapper fine unused. H&G 9. ZANZIBAR - 1891 1 1/2a blue 'Indian' PSC to Germany used at ZANZIBAR via French ship. 1891 (DE.4.) 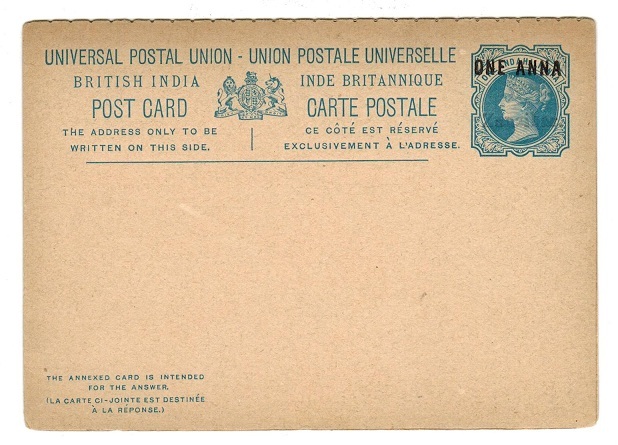 use of Indian (unoverprinted) 1 1/2a blue on cream postal stationery postcard addressed to Germany (genuine use with long message) cancelled by ZANZIBAR squared circle cancel with REUNION A MARSEILLE/L.V.No.2 maritime handstamp applied and with HAMBURG arrival. A scarce use of this Indian stationery in Zanzibar. 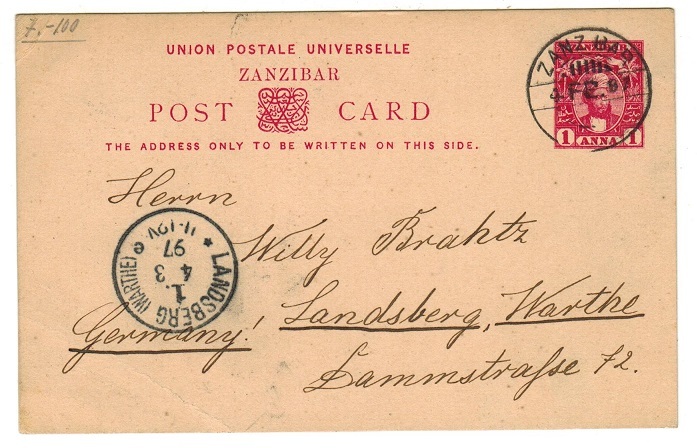 ZANZIBAR - 1908 6c red postal stationery wrapper addressed to Germany. H&G 10. 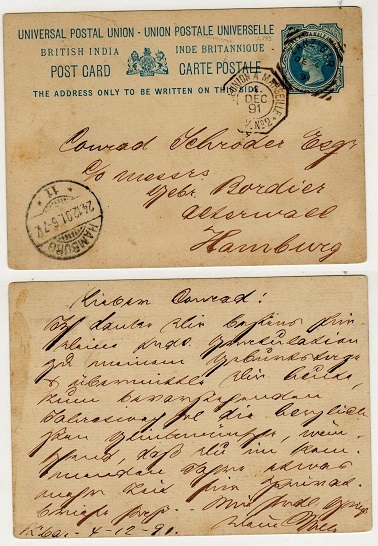 1908 6c red on buff postal stationery wrapper addressed to Germany cancelled by squared circle ZANZIBAR cds dated SE.7.13. H&G 10. ZANZIBAR - 1904 1/2a light green PSC to UK uprated with additional 1a. H&G 13. 1904 1/2a Light green on buff postal stationery postcard addressed to UK bearing additional 1a (SG 211) tied by squared circle ZANZIBAR cds. H&G 13. ZANZIBAR - 1918 20c blue RPSE unused. H&G 8. 1918 20c Blue on creamy white (size F) registered stationery envelope unused. H&G 8. ZANZIBAR - 1918 20c blue RPSE unused. H&G 8a. 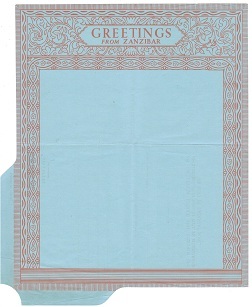 1918 20c blue on cream registered postal stationery envelope (size J) in fine unused condition. H&G 8a. ZANZIBAR - 1902 1a rate postcard use to Austria. 1902 (28.NO.) 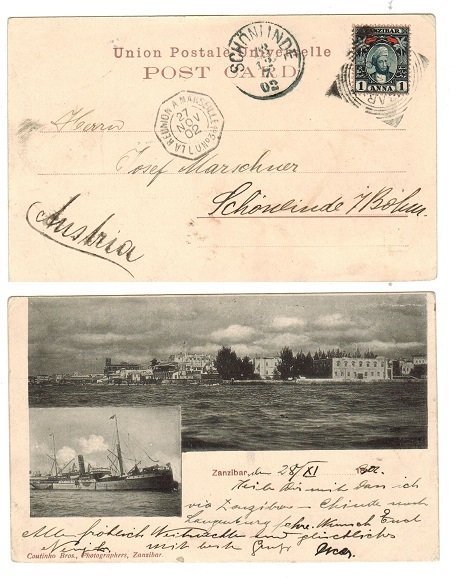 use of postcard addressed to Austria depicting a scene of Zanzibar from the sea and motor cruiser bearing 1a adhesive tied by squared circle ZANZIBAR cds with octagonal LA REUNION A MARSEILLE/L.U.No.3 strike at left. ZANZIBAR - 1908 6c red PSC to Germany used at ZANZIBAR. H&G 18. 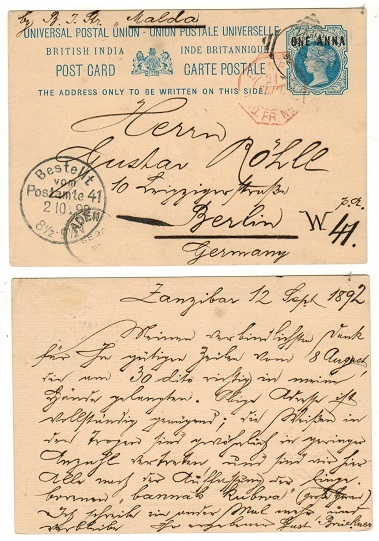 1908 6c red on buff postal stationery postcard addressed to Germany cancelled by squared circle ZANZIBAR cancel dated DE.5.1912. H&G 18. ZANZIBAR - 1964 30c 'Jamhuri' mint pair one with OVERPRINT MISSING. SG 419. 1964 30c carmine-red and black marginal adhesive mint pair handstamped JAMHURI 1964 on one but with the other having variety MISSING HANDSTAMP. (Slight perf separation.) SG 419. 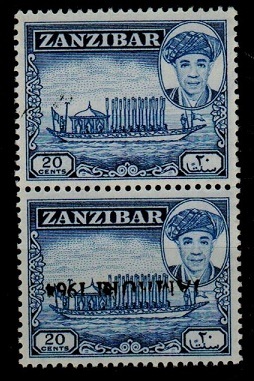 ZANZIBAR - 1964 5c mint pair with JAMHURI OVERPRINT DOUBLE on one stamp. SG 394. 1964 5c orange and deep green corner marginal adhesive mint pair both handstamped JAMHURI 1964 in black but with one having the variety HANDSTAMPED TWICE. SG 394. 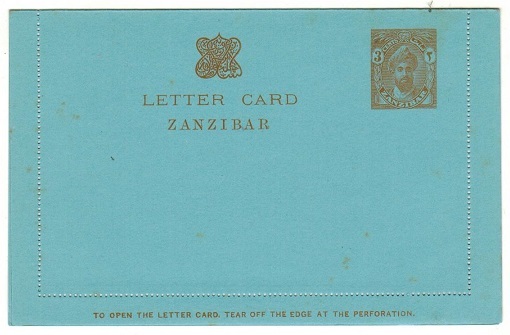 ZANZIBAR - 1964 'Jamhuri' adhesive use of cover to UK. 1964 (JU.1.) cover addressed to UK bearing 10c single and 40c strip of three adhesives overprinted JAMHURI/1964 and cancelled ZANZIBAR. 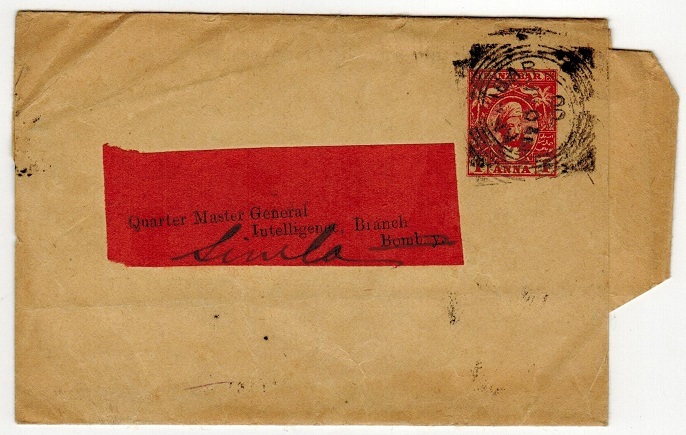 ZANZIBAR - 1897 1a red postal stationery wrapper to India cancelled ZANZIBAR. H&G 4. 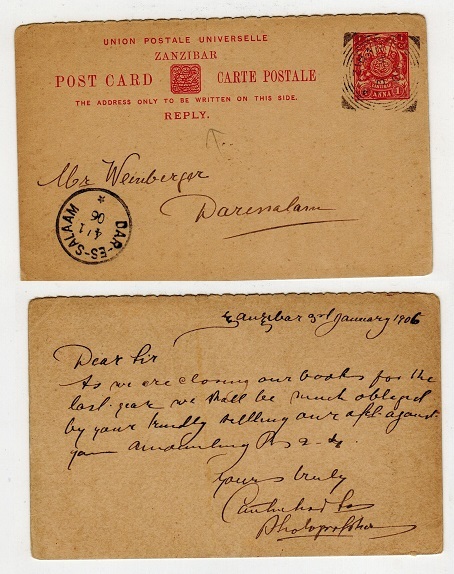 1897 1a red on buff postal stationery wrapper addressed to India cancelled by squared circle ZANZIBAR cds dated 20.AP.00. H&G 4. ZANZIBAR - 1947 20c rate cover to Tanganyika used at WETE. 1947 (OC.8.) 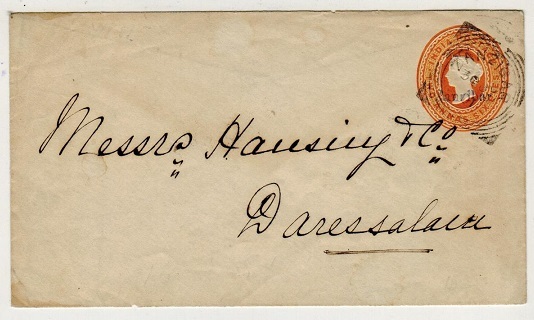 cover addressed to Daressalaam in Tanganyika bearing a fine pair of the 10c black adhesive tied by WETE cds. ZANZIBAR - 1904 2a brown RPSE (size F) fine unused. H&G 4. 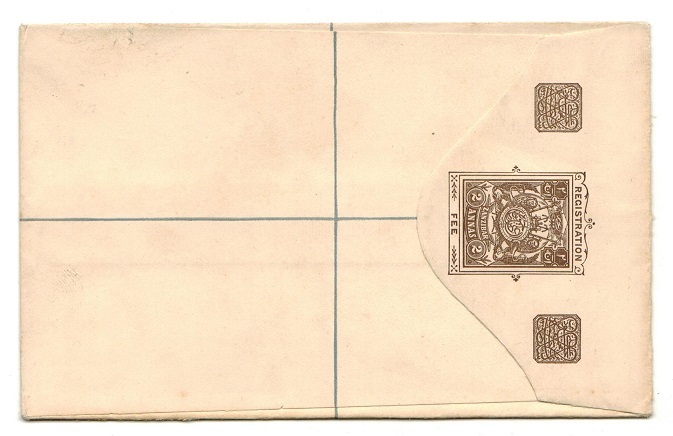 1904 2a brown on cream registered postal stationery envelope (size F) in unused condition. H&G 4. 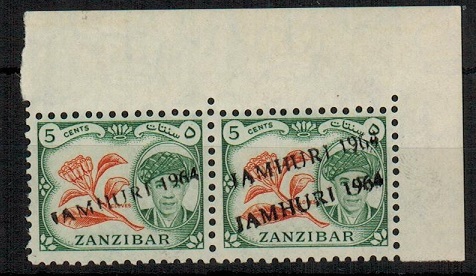 ZANZIBAR - 1964 1.25sh 'Jamhuri' overprint mint pair ONE WITHOUT SURCHARGE. SG 404. 1964 1.25sh slate and carmine adhesive in a fine unmounted mint horizontal pair showing the 'Jamhuri 1964' overprint on one issue in pair with OVERPRINT OMITTED on the other. SG 404. 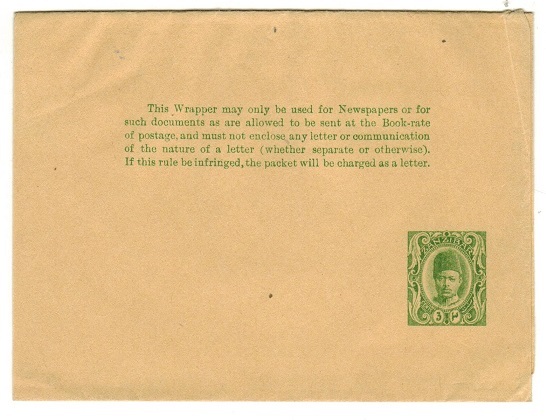 ZANZIBAR - 1895 1/2a green PSE unused with overprint in black. H&G 1a. 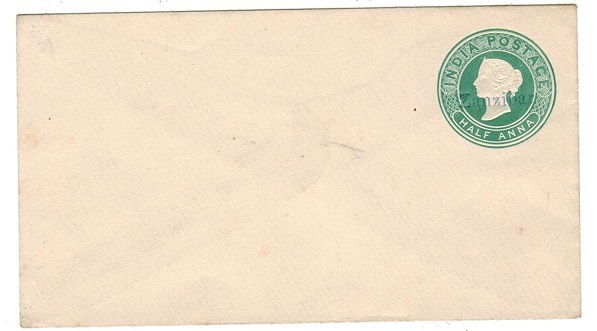 1895-96 1/2a Green on white postal stationery envelope (type a) fine unused with 'black' overprint. H&G 1a. ZANZIBAR - 1954 'Sultans 75th Birthday' illustrated FDC. 1954 (AU.26.) 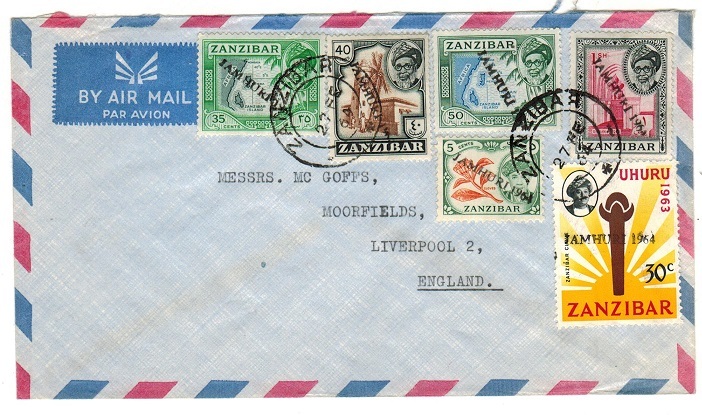 illustrated first day cover addressed locally bearing the 'Sultans 75th Birthday' issue (SG 353-357 tied ZANZIBAR. ZANZIBAR - 1954 'Sultans 75th Birthday' illustrated registered FDC. 1954 (AU.26.) 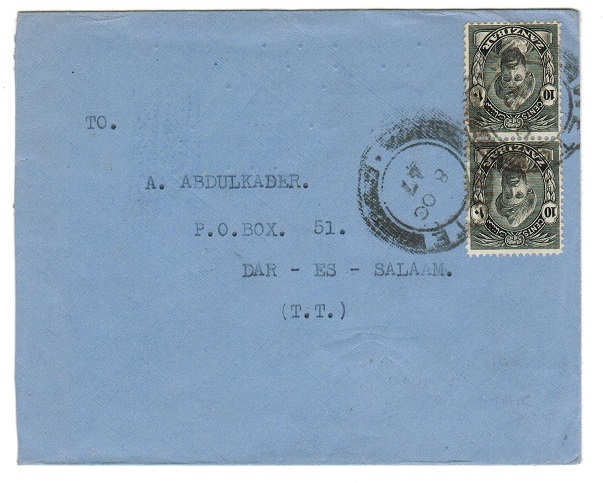 illustrated registered first day cover addressed locally bearing the 'Sultans 75th Birthday' issue (SG 353-357 tied ZANZIBAR. ZANZIBAR - 1934 4c rate cover to UK. 1934 (AP.4.) 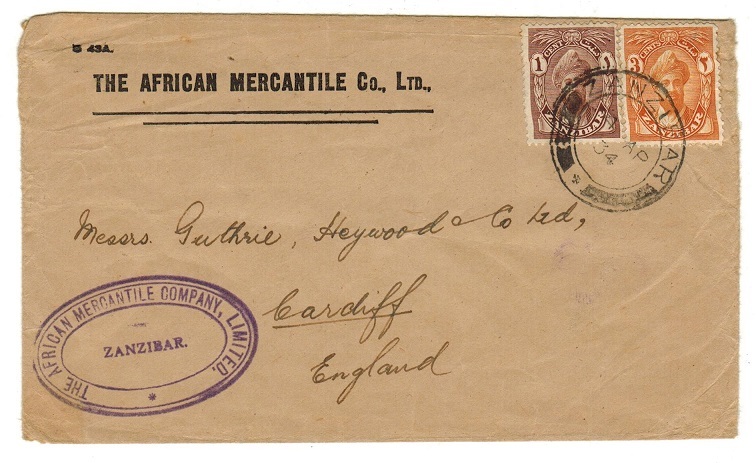 commercial 'African Mercantile Co. Ltd.' cover addressed to UK bearing 1c and 3c adhesives tied ZANZIBAR. ZANZIBAR (French) -1901 1a on 10c black surcharge use on postcard to Egypt. 1901 (1.OT.) 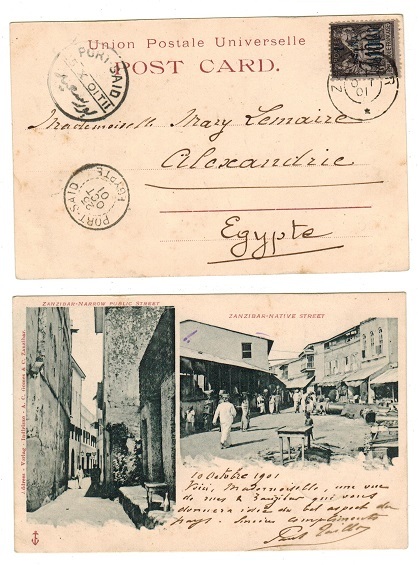 use of picture postcard addressed to Egypt depicting two street scenes 'Zanzibar- Narrow Public Street + Zanzibar-Native Street' bearing French surcharged '1/anna/Zanzibar' on 10c black adhesive tied by d/r ZANZIBAR cds. PORT SAID transit. ZANZIBAR (French) - 1 1/2a red on 5c green PSE to Germany used at ZANZIBAR. 1898 (SEP.24.) 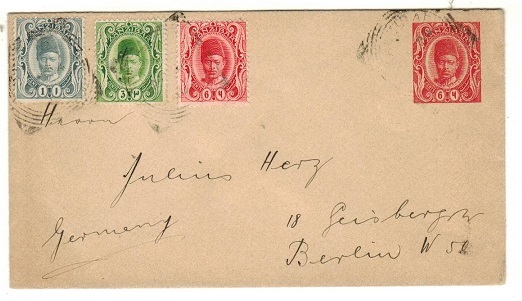 use of French 5c green on cream postal stationery envelope overprinted in red 1/2/ANNA/ZANZIBAR addressed to Germany and cancelled by near ZANZIBAR d/r cds. A nice use of this surcharged stationery. ZANZIBAR - 1964 registered 'Independence' cover overprinted JAMHURI 1964. 1963 (FE.5.) registered cover to UK (very light foxing and small hole) bearing the 'Independence' series of four each hanstamped JAMHURI 1964. ZANZIBAR - 1930 6c rate cover to UK. 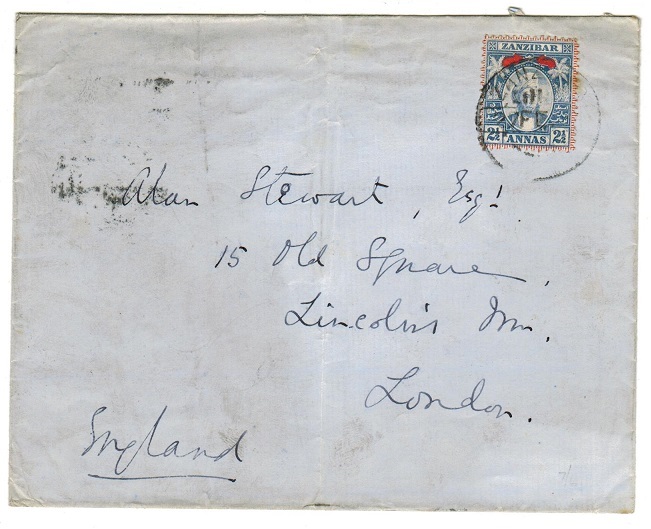 1930 (AU.13) cover to UK bearing 6c (SG 302) tied by squared circle ZANZIBAR cds. ZANZIBAR - 1926 20c cover to UK cancelled by small ZANZIBAR cds. 1926 (DE.16) cover to UK bearing 20c indigo (SG 286) tied by small s/r ZANZIBAR cds. 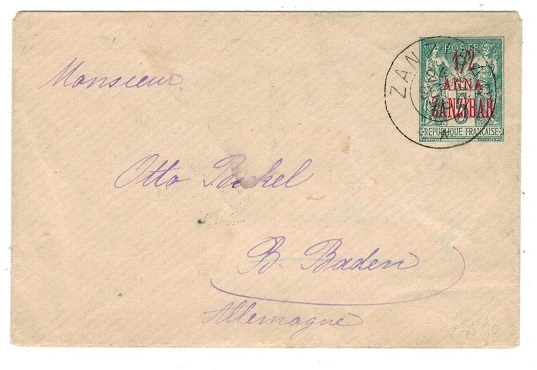 ZANZIBAR - 1904 scarce 'reply' section of the 1a+1a PSRC addressed to Tanganyika. H&G 16. 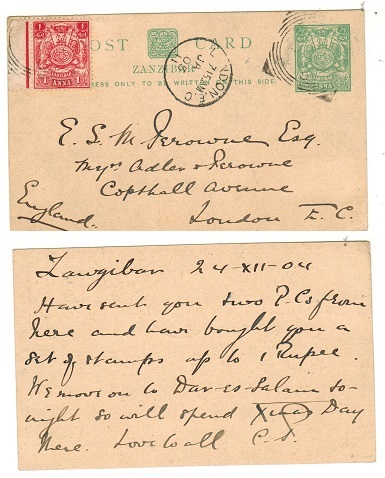 1904 reply section of the 1a+1a Red on buff postal stationery reply type postcard addressed to Daressalaam & cancelled by squared circle ZANZIBAR cds dated 3.JA.06. H&G 16. ZANZIBAR - 1905 1/2a (x4) cover to UK cancelled by squared circle ZANZIBAR cancel. 1905 (JU.19.) 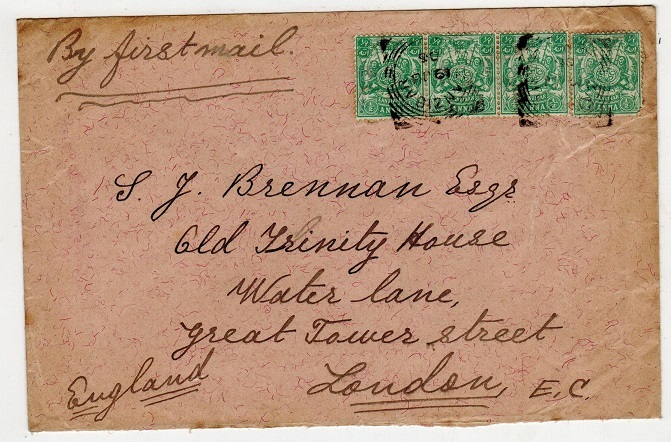 cover addressed to UK bearing a fine strip of four of the 1/2a adhesive (SG 210) tied by squared circle ZANZIBAR cds's. ZANZIBAR - 1898 2 1/2a rate cover to USA. 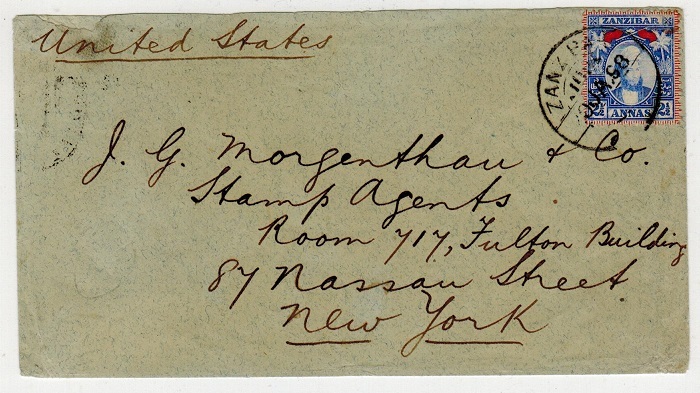 1898 (JA.10) cover to USA bearing 2 1/2a (SG 160) tied by ZANZIBAR cds. Scarce. ZANZIBAR - 1897 2 1/2a ultramarine PSE to Holland. H&G 5a. 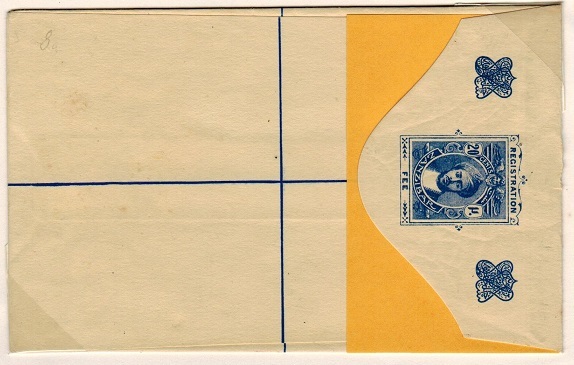 1897 2 1/2a ultramarine on white laid paper postal stationery envelope (type b) addressed to Holland & cancelled by squared circle ZANZIBAR cds dated 16.JA.99. H&G 5a. Scarce. ZANZIBAR - 1964 JAMHURI handstamp cover to UK. 1964 (JA.29.) cover addressed to UK bearing 25c,30c,35c and 40c adhesives each handstamped JAMHURI 1964 in black and having crosses through the rulers head in ink cancelled by d/r ZANZIBAR cds. 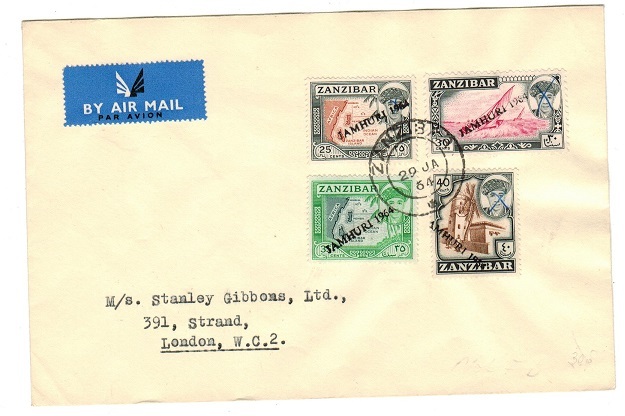 ZANZIBAR - 1964 JAMHURI overprints on cover to UK. 1964 (JA.29.) 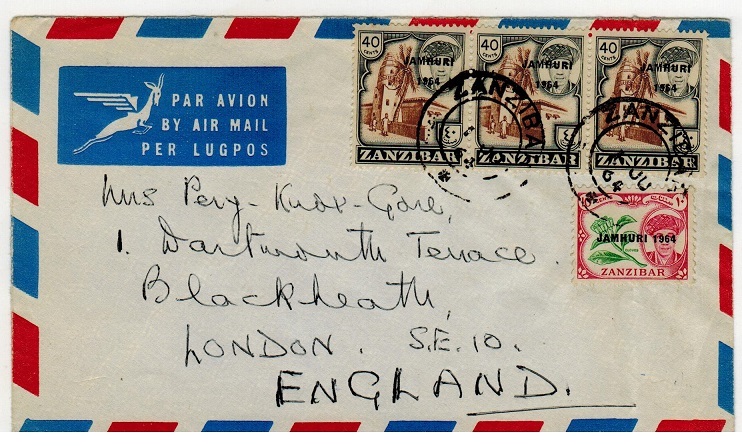 cover addressed to UK bearing 5c and 1'25 adhesives overprinted with black JAMHURI 1964 handstamp and cancelled ZANZIBAR. The 1'25 having the portrait crossed with two lines to deface as is usual. ZANZIBAR - 1895 1a on 1 1/2a PSC to Holland. H&G 2. 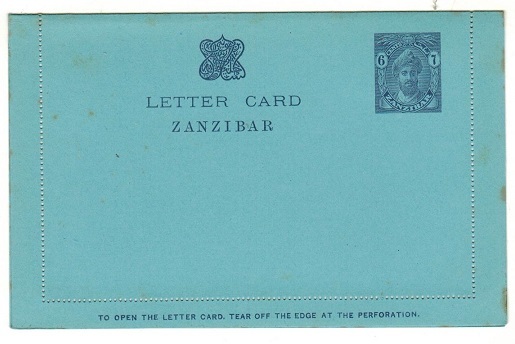 1895-96 1a surcharge on 1 1/2a Blue on cream postal stationery postcard with blue overprint of 'Zanzibar' (type b) addressed to Holland & cancelled by ZANZIBAR cds dated 23.NO.98. H&G 2. ZANZIBAR - 1897 1a PSC addressed to Germany used at ZANZIBAR. H&G 6. 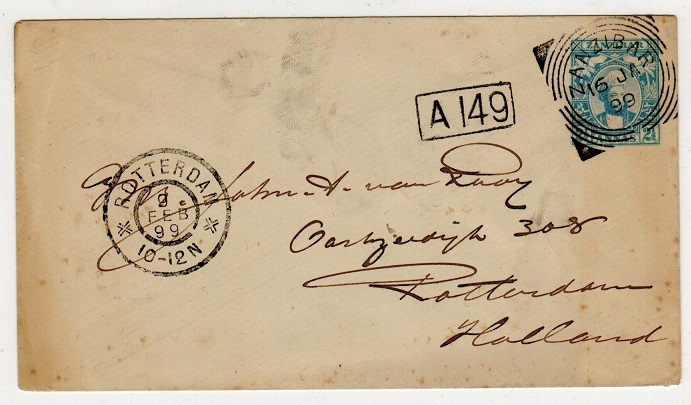 1897 1a Carmine on buff postal stationery postcard addressed to Germany cancelled ZANZIBAR & dated 4.FE.97. H&G 6. ZANZIBAR - 1897 2 1/2a rate cover to UK. 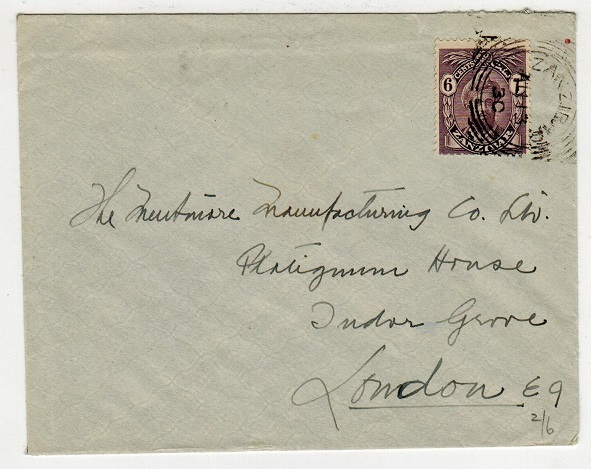 1897 (FE.27) cover to UK bearing 2 1/2a (SG 161) tied by ZANZIBAR cds. 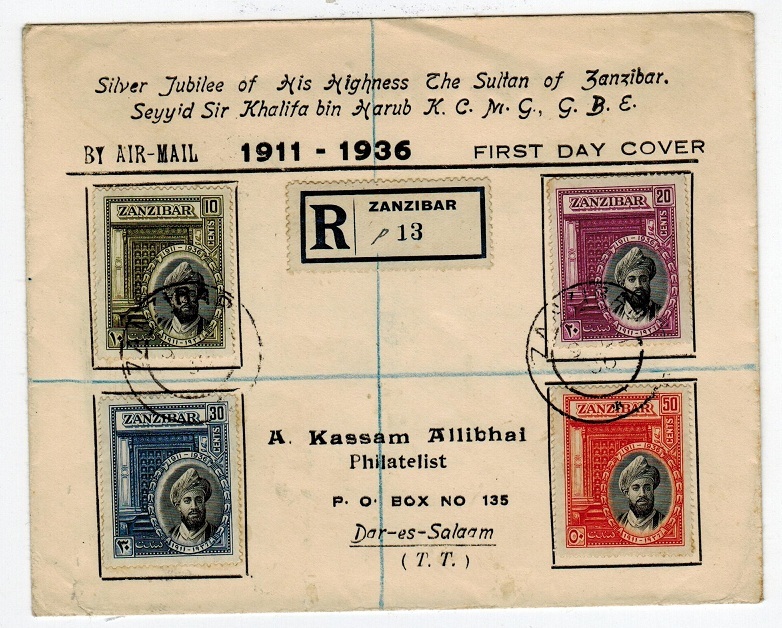 ZANZIBAR - 1901 2 1/2a rate cover to UK. 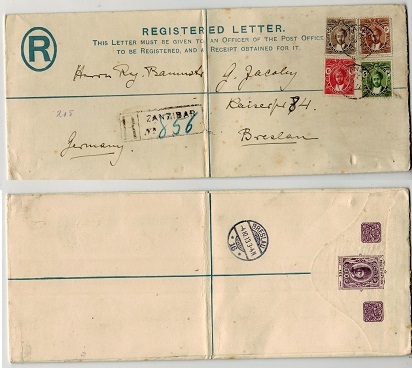 1901 (OC.3) cover to UK bearing 1/2a & 1a pair (SG 188+89) tied by squared circle ZANZIBAR cds. ZANZIBAR - 1964 50c blue and grey unmounted pair with JAMHURI overprint OMITTED on one. SG 402. 1964 50c blue and grey green adhesive in a unmounted mint horizontal pair with one stamp handstamped JAMHURI 1964 the other OMITTED. SG 402. 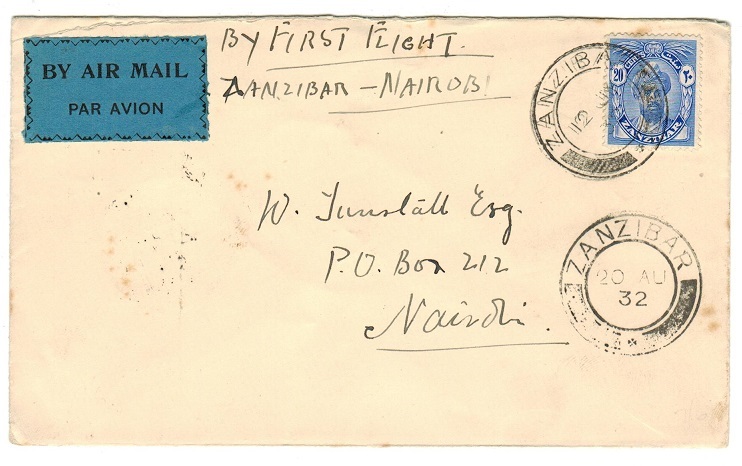 ZANZIBAR - 1932 first flight cover to Nairobi. 1932 (AUG.20.) 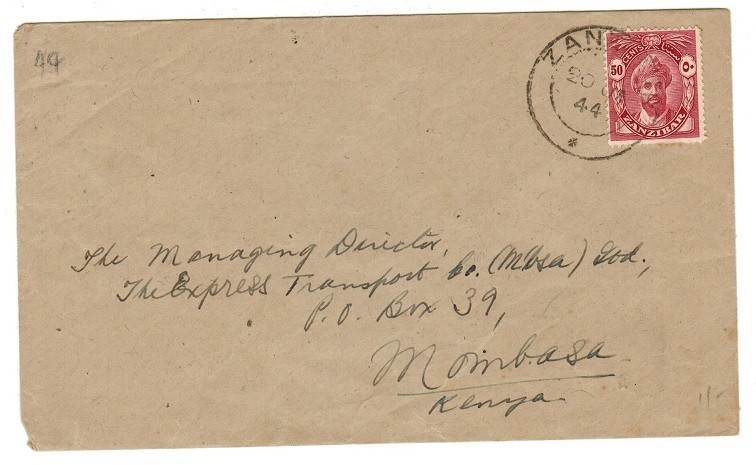 first flight cover addressed to Nairobi bearing 20c adhesive tied by ZANZIBAR cds. NAIROBI/KENYA arrival b/s. 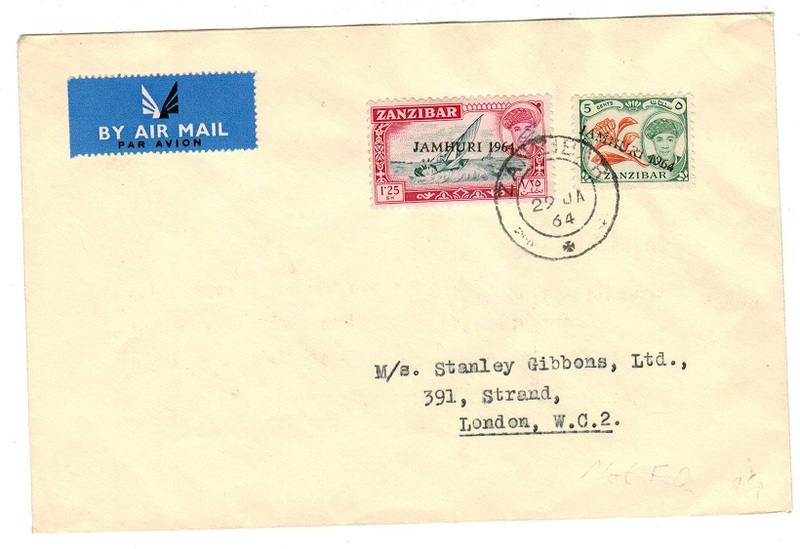 ZANZIBAR - 1948 1/- rate air mail cover to India. 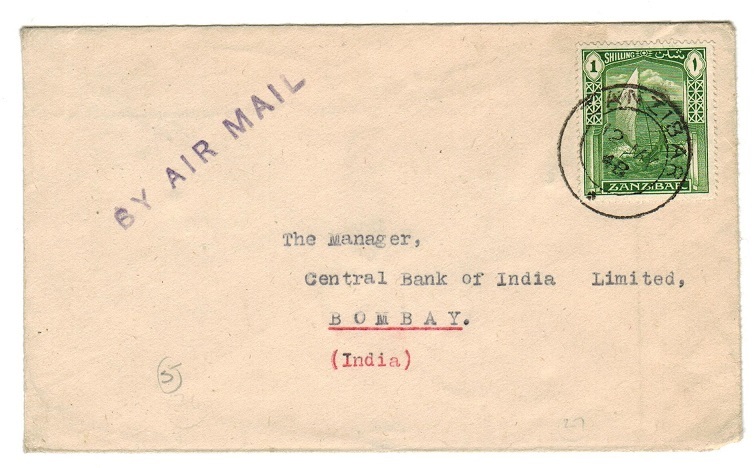 1948 (MY.12) cover to India bearing 1/- tied ZANZIBAR with violet s/l BY AIR MAIL h/s at left. 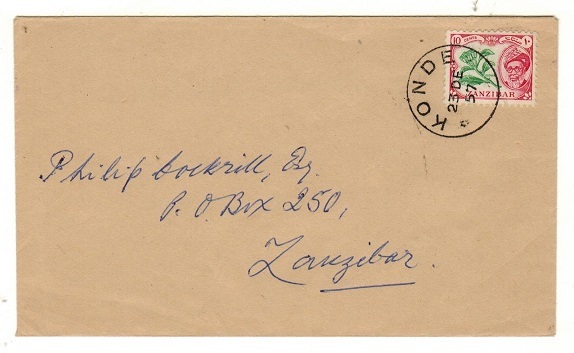 ZANZIBAR - 1946 registered 'Victory' first day cover addressed locally. 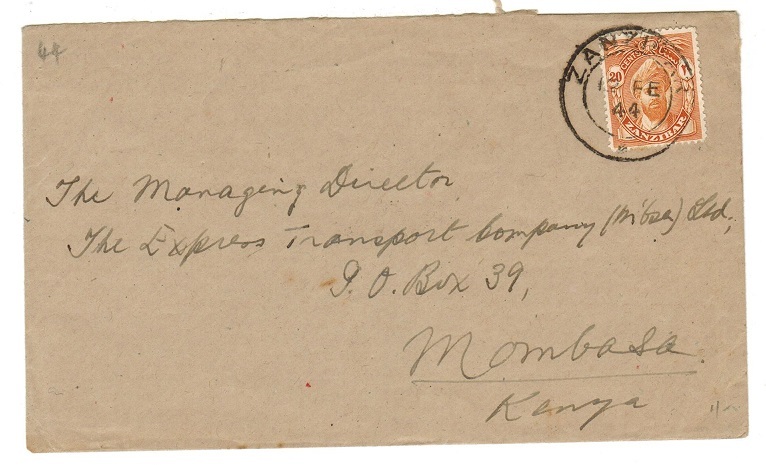 1946 (NO.11) registered first day cover to Tanga bearing the 'Victory' pair (SG 331-32) tied by ZANZIBAR cds's. ZANZIBAR - 1944 20c rate cover to Kenya. 1944 (FE.12) cover to Mombasa bearing 20c adhesive tied by ZANZIBAR cds. ZANZIBAR - 1944 50c rate cover to Kenya. 1944 (JA.20) cover to Mombasa bearing 50c adhesive tied by ZANZIBAR cds. ZANZIBAR - 1940 cover to UK. 1940 (JY.13) cover to UK bearing 25c + 1/- adhesives tied ZANZIBAR. ZANZIBAR - 1964 20c JAMHURI h/s mint pair with INVERTED and MISSING overprint varieties. 1964 20c Ultramarine in an unmounted mint pair showing the JAMHURI 1964 h/s INVERTED on one and MISSING on the other. A nice combination. Scarce. SG397. With and without overprints. ZANZIBAR - 1907 1a rate postcard use to Austria. 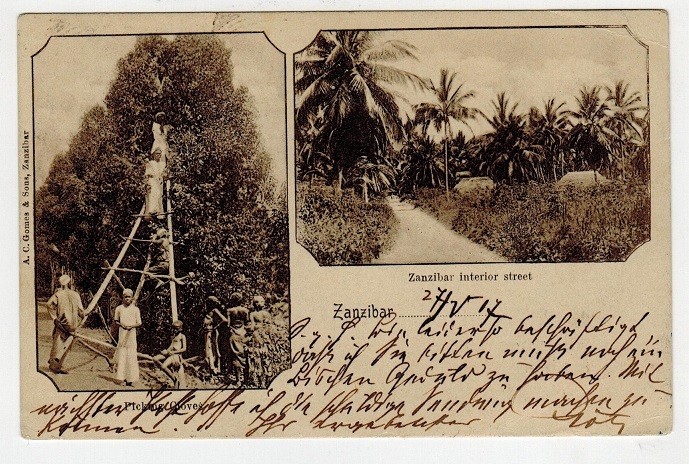 1907 use of black & white picture postcard addressed to Austria depicting 'Picking Cloves + Zanzibar interior stree' bearing 1a (SG 211) tied by squared circle ZANZIBAR cds. ZANZIBAR - 1932 stampless POSTAL SERVICE envelope to USA. 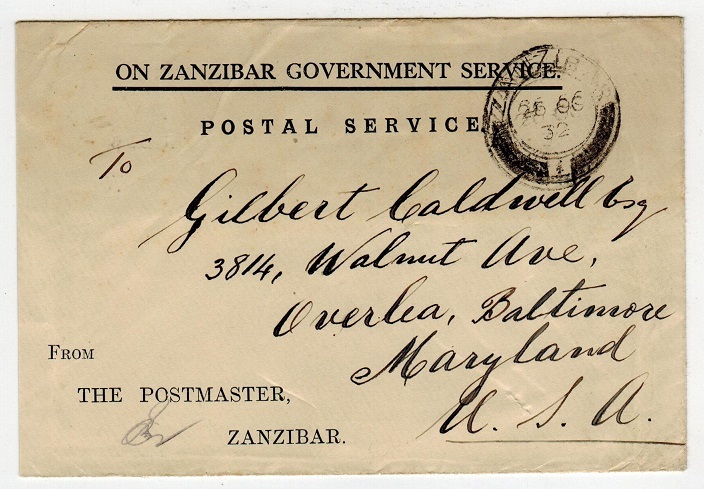 1932 (OC.26) 'Postal Service/On Zanzibar Government Service' official stampless postmaster envelope addressed to USA cancelled by ZANZIBAR cds. 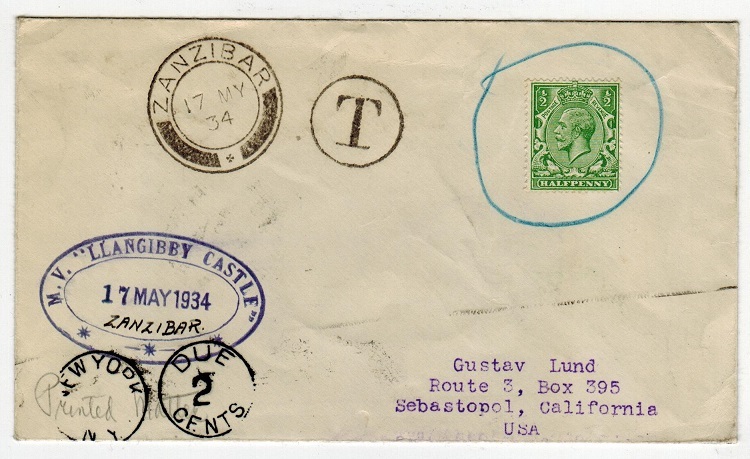 ZANZIBAR - 1934 taxed maritime cover to USA used on board M.V.LLANGIBBY CASTLE. 1934 (MY.17.) 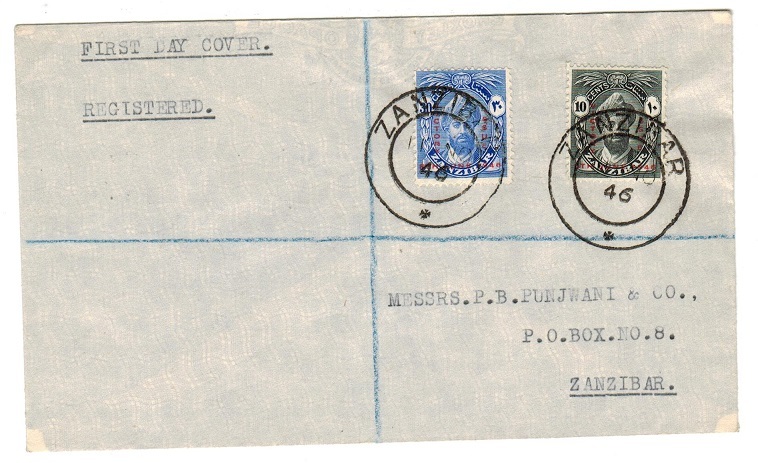 cover addressed to UK bearing GB 1/2d adhesive ringed in blue manuscript as being unaccepted and with circular 'T' tax mark alongside with ZANZIBAR cds. Violet oval M.V.LLANGIBBY CASTLE maritime h/s applied below with 'Zanzibar' inserted in manuscript. Opera glass type NEW YORK/ DUE 2 CENTS tax mark applied on arrival. ZANZIBAR (French) - 1898 1a+1a on 10c+10c RPSC unused. H&G 8. FRENCH - 1898 1 Anna + 1 Anna /ZANZIBAR overprint in blue on French 10c+10c black on bluish postal stationery reply type postcard in fine unused condition. H&G 8. ZANZIBAR - 1929 6c rate cover addressed to UK. 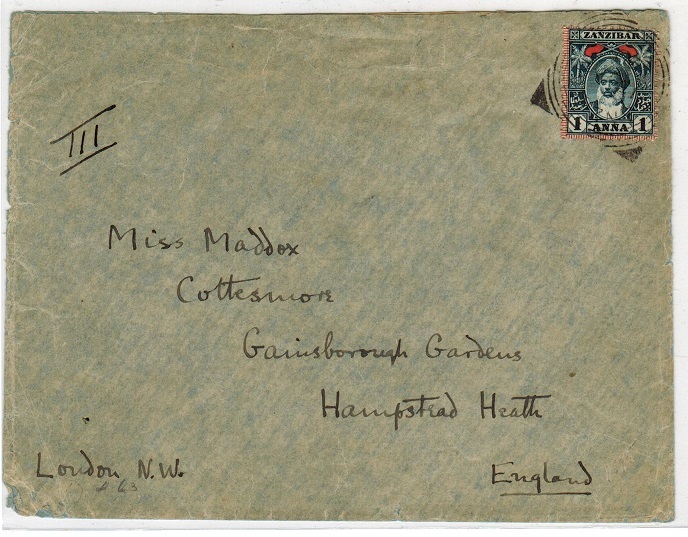 1929 (NO.6) cover to UK bearing 6c (SG 302) tied by squared circle ZANZIBAR cds. ZANZIBAR - 1927 3c rate cover to UK. 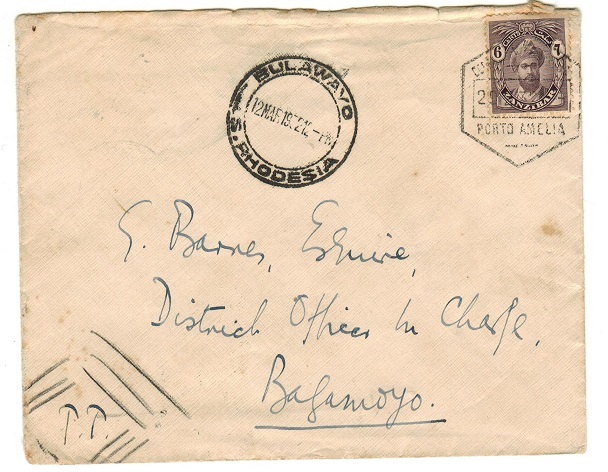 1927 (JY.15) cover to UK bearing 3c tied by squared circle ZANZIBAR cds. ZANZIBAR - 1890 1a rate cover to UK. 1890 (JY.15.) 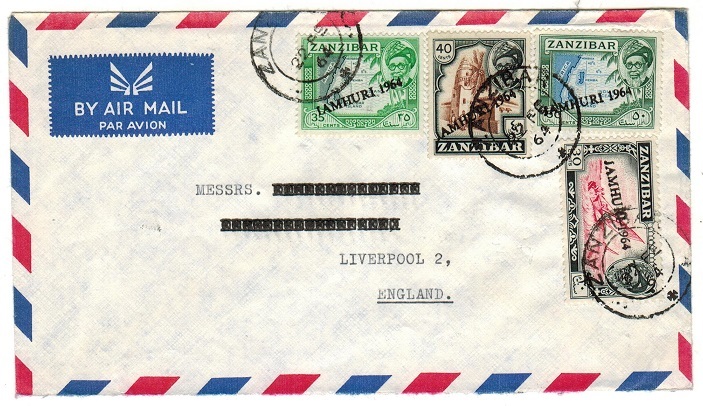 cover addressed to UK bearing 1a adhesive (SG 189) tied by squared circle ZANZIBAR cds. ZANZIBAR - 1897 2a RPSE to USA with additional 2 1/2a and 5a used at ZANZIBAR. H&G 2a. 1897 2a brown red on cream registered postal stationery envelope (size J) addressed to USA (fold at left) bearing 2 1/2a and 5a adhesives tied by small ZANZIBAR cds dated 15.DE.98. A scarce piece of stationery. H&G 2a. ZANZIBAR - 1895 1/4a + 1/4a PSRC unused. H&G 3a. 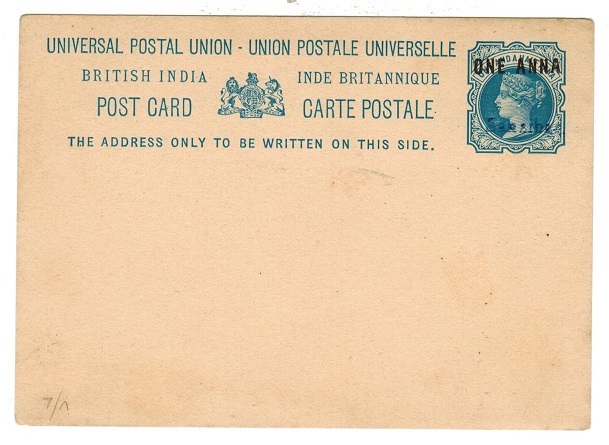 1895-96 1/4a+1/4a Brown on buff postal stationery reply type postcard in fine unused condition with `black' ovpt. H&G3a. ZANZIBAR - 1895 1/4a + 1/4a PSRC unused with NO STOP AFTER ZANZIBAR variety. H&G 3a. 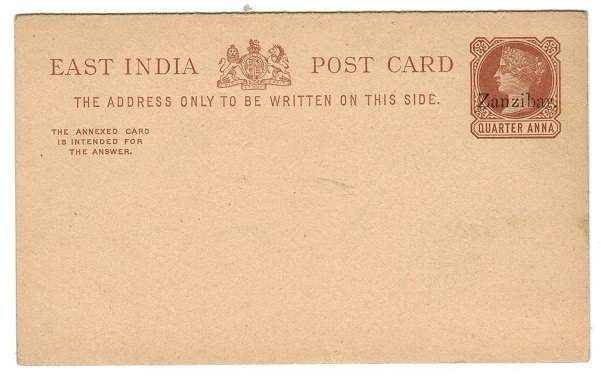 1895-96 1/4a+1/4a brown on buff postal stationery reply type postcard in fine unused condition with 'Black' overprint showing the variety NO STOP AFTER ZANZIBAR on the 3 1/4mm Z setting on the smaller print card. H&G3a. ZANZIBAR - 1895 1/2a green PSE unused. H&G 1. 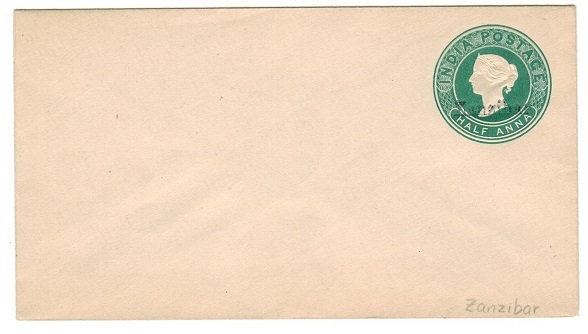 1895-96 1/2a Green on white postal stationery envelope (type a). Fine unused. H&G 1. ZANZIBAR - 1895 1a surcharge on 1 1/2a blue on cream PSC unused. H&G 2. 1895-96 1a surcharge on 1 1/2a Blue on buff postal stationery postcard. Fine unused. H&G 2. ZANZIBAR - 1895 2a ultramarine on cream RPSE unused. H&G 1. 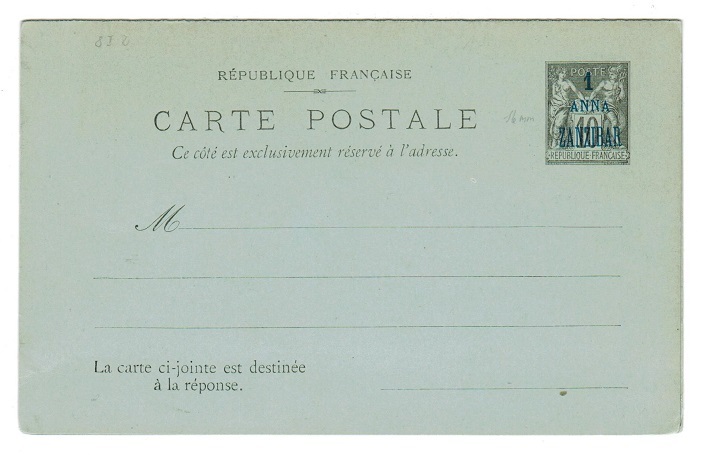 1895-96 2a Ultramarine on creamy white registered postal stationery envelope (size F) in fine unsued condition. H&G 1. ZANZIBAR - 1895 2a6p orange on white PSE unused. H&G 4. 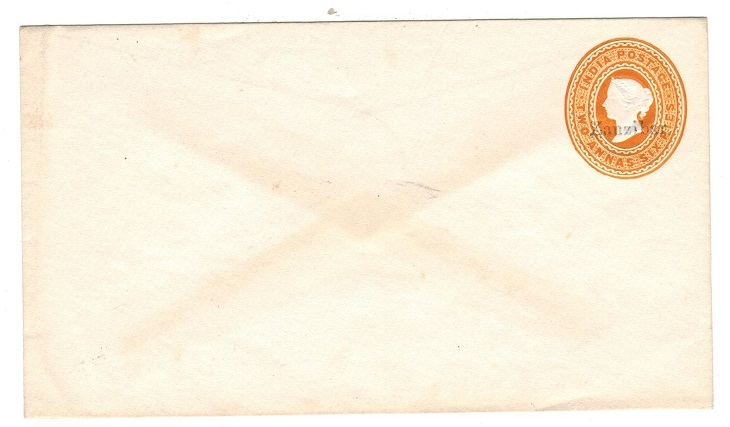 1895-96 2a6p Orange on white postal stationery envelope. Fine unused. H&G 4. ZANZIBAR - 1897 2a brown-red on cream RPSE unused. H&G 2. 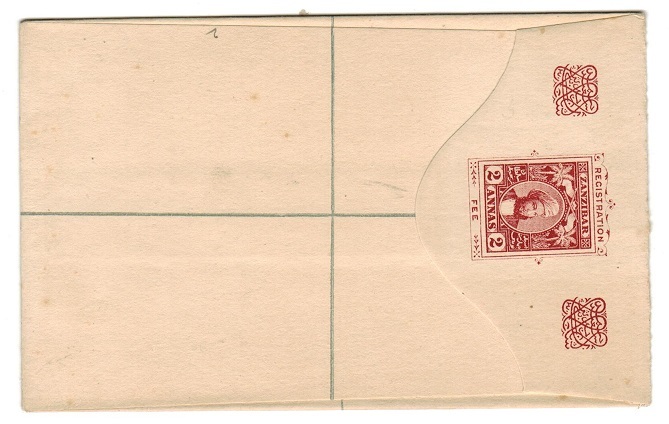 1897 2a Brown red on creamy white registered postal stationery envelope (size F) in fine unused condition. H&G2. 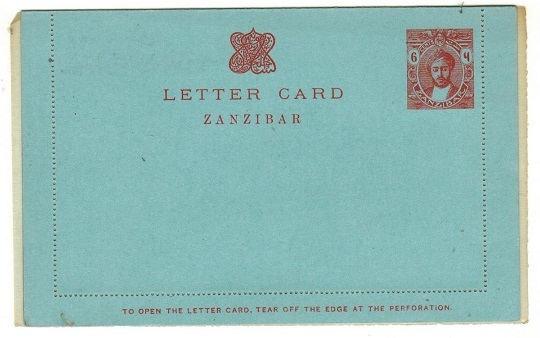 ZANZIBAR - 1950's (circa) FORMULA air letter unused with GREETINGS/FROM ZANZIBAR interior. 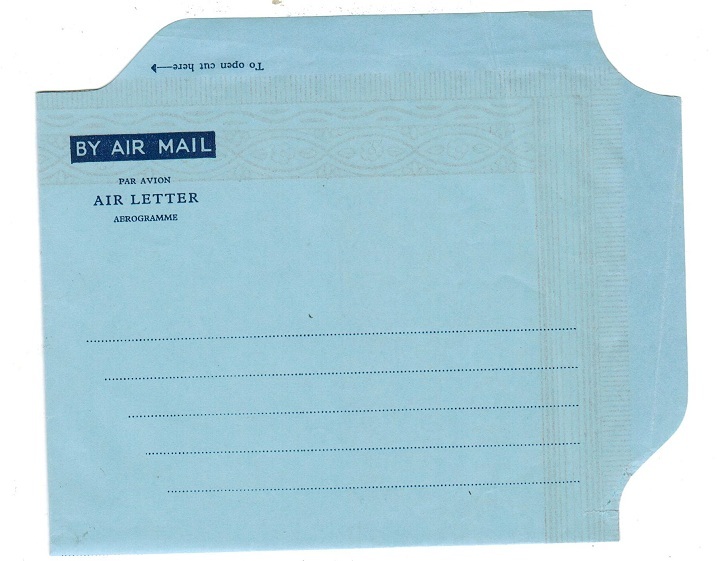 1950's (circa) dark blue on blue FORMULA 'Air Letter/Aerogramme' in unused condition with preprinted GREETINGS/FROM ZANZIBAR inside in orange-red. Unusual item. 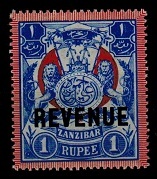 ZANZIBAR - 1904 1r blue and red (SG 220a) mint (Sideways wmk) REVENUE. 1904 1r Blue & red (SG 220a) in very fine mint condition with major variety WATERMARK SIDEWAYS and ovpt'd REVENUE in black. 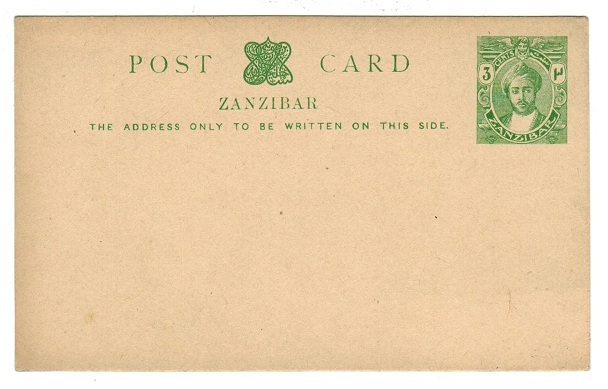 ZANZIBAR - 1904 1/2a green postal stationery wrapper to Tanga cancelled ZANZIBAR. H&G 7. 1904 1/2 a green on buff postal stationery newspaper wrapper addressed to 'D.O.A.G. 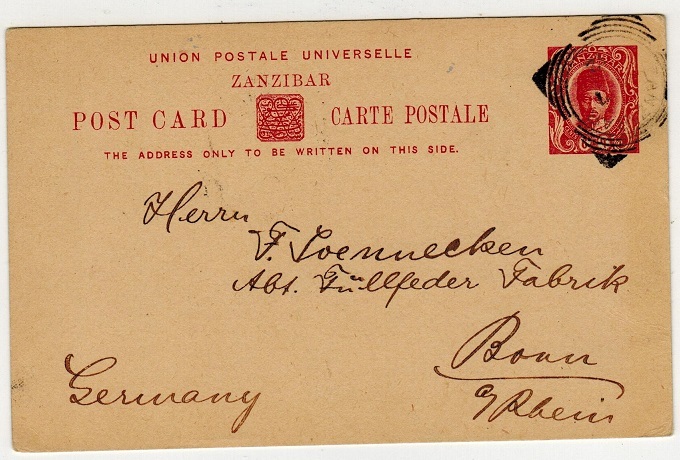 Tanga' (German Colonial Office) and cancelled by squared circle ZANZIBAR cds dated 13.JY.06. H&G 7. ZANZIBAR - 1940 illustrated THIRD WORLD CRUISE signed cover from ZANZIBAR. 1940 (DE.10.) 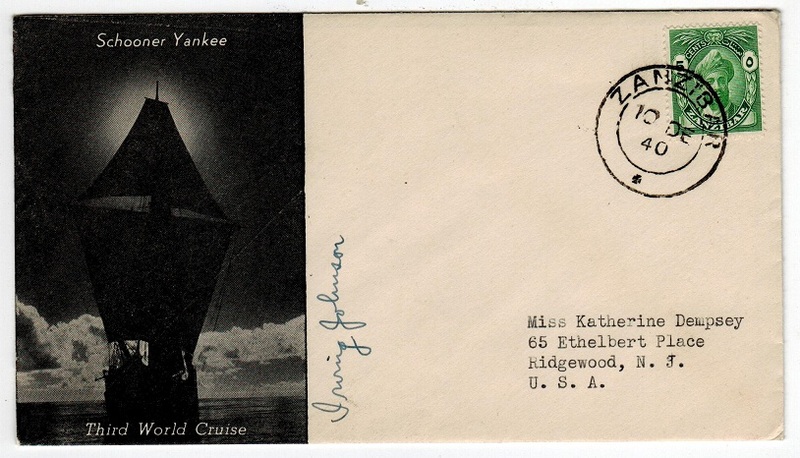 illustrated SCHOONER YANKEE/THIRD WORLD CRUISE cover addressed to USA bearing 5c adhesive tied ZANZIBAR and signed by Irving Johnson. 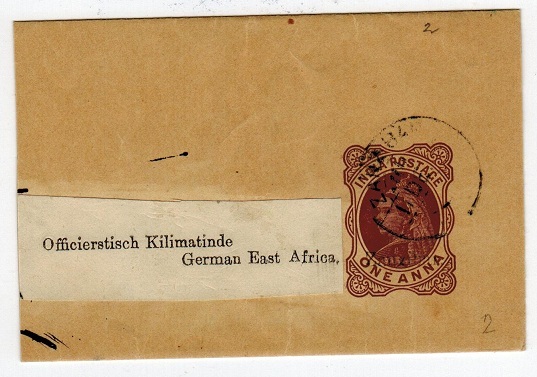 ZANZIBAR - 1895 1a Postal stationery wrapper to German East Africa. H&G 2. 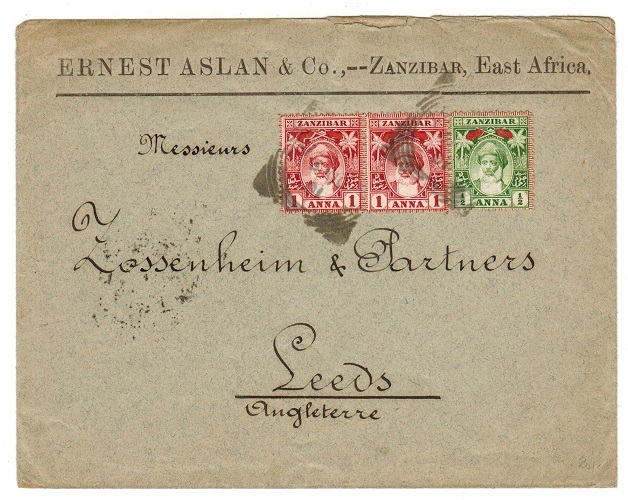 1895 1a Brown on buff postal stationery wrapper addressed to Germany East Africa (slightly reduced at left) & cancelled by fine ZANZIBAR cds. Scarce. H&G 2. ZANZIBAR - 1897 2 1/2a PSE to Germany used from ZANZIBAR. H&G 5. 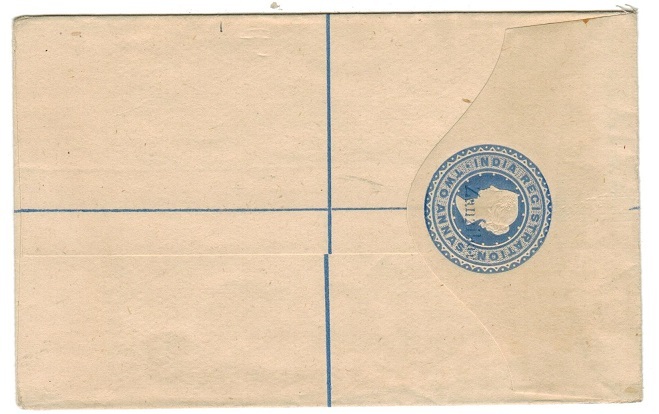 1897 2 1/2a Ultramarine on white laid paper postal stationery envelope (type a) addressed to Germany & cancelled by squared circle ZANZIBAR cds dated 21.JU.08. H&G5. ZANZIBAR - 1913 6c+6c red on budd RPSC unused. H&G 24. 1913 6c+6c Red on buff postal stationery reply type postcard. Fine unused. H&G 24. ZANZIBAR - 1913 3c green on buff PSC unused. H&G 21. 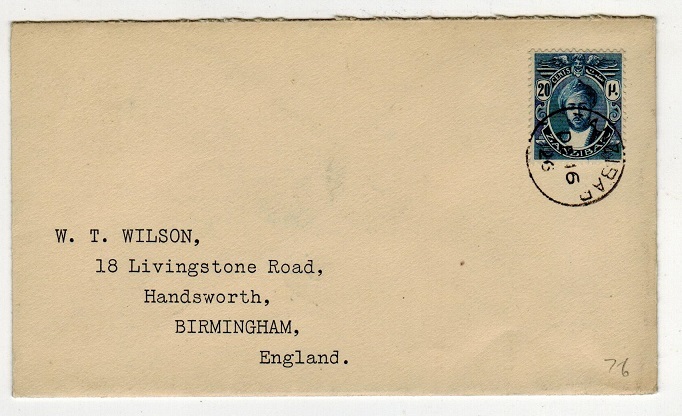 1913 3c Green on buff postal stationery postcard. Fine unused. H&G 21. ZANZIBAR - 1908 6c red on buff PSC unused. H&G 18. 1908 6c Red on buff postal stationery postcard. Fine unused. H&G 18. ZANZIBAR - 1904 1a+1a RPSC handstamped diagonally SPECIMEN. H&G 16. 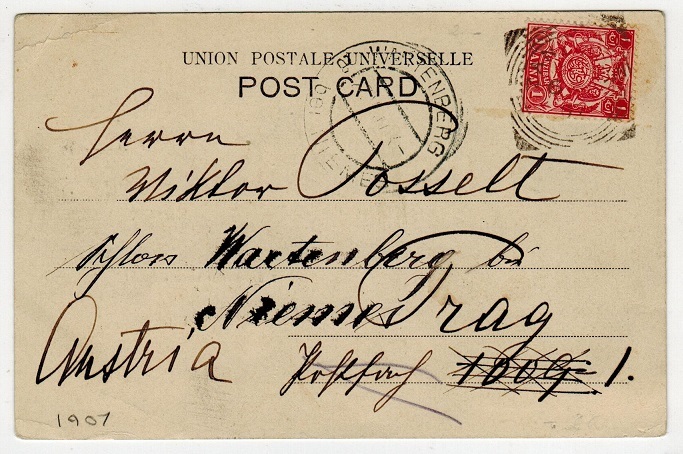 1904 1a+1a Red on buff postal stationery reply type postcard. Fine unused with diagonal SPECIMEN h/s. H&G 16. ZANZIBAR - 1895 ONE ANNA surcharge on 1 1/2a+1 1/2a RPSC unused. H&G 4. 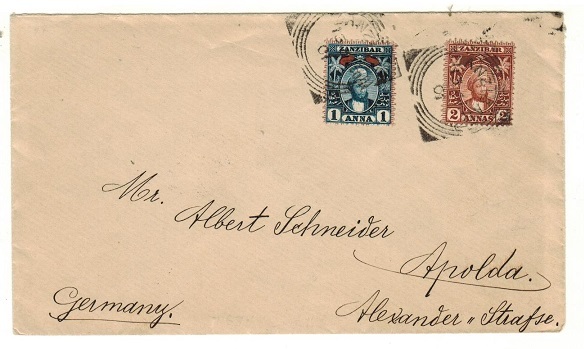 1895-96 1a surcharges on 1 1/2a + 1 1/2a Blue on buff postal stationery reply type postcard in fine unused condition. H&G 4. ZANZIBAR - 1936 set on FDC . 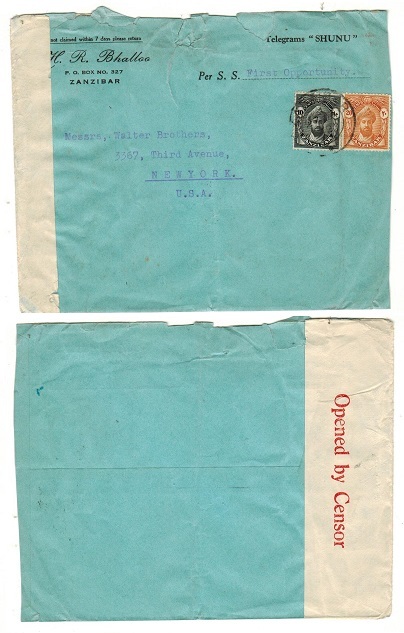 1936 (DEC.9) pre-printed '1911-36/First Day cover' addressed to Daressalaam & bearing the set of four (SG323-26) tied by ZANZIBAR cds with blue on white R/ZANZIBAR label at left. ZANZIBAR - 1937 first flight cover to Daressalam via SOUTH BOUND route. 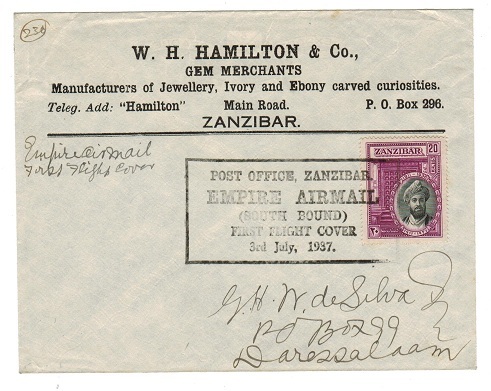 1937 (JUL.3) use of pre-printed W.H.HAMILTON/GEM MERCHANTS/ZANZIBAR envelope addressed to Daressalam & bearing 20c (SG324) tied by lartge black boxed POST OFFICE ZANZIBAR/EMPIRE AIRMAIL/SOUTH BOUND/FIRST FLIGHT COVER/3rd JULY 1937 h/s.